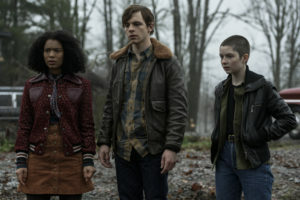 Late last year, KSiteTV was among a group of journalists to visit the Vancouver sets of the Netflix Original Series Chilling Adventures of Sabrina… and among the people we spoke there was Lachlan Watson, an actor whose very presence — a non-binary performer playing a non-binary character — is something special and groundbreaking. Now that Season 1B has dropped today (April 5) on Netflix, we are starting to roll out our interviews from the set visit, which took us places including the Spellman Mortuary and Baxter High. We saw some new sets as well, and we got to meet one of the feline performers who plays Salem! But first… let’s see what Lachlan Watson had to say about their Sabrina role! Watson’s character Susie and their friend Roz learned the truth about Sabrina in the first part of Chilling Adventures of Sabrina Season 1, and yes, that means that the characters will be a larger part of the action. Lachlan also thinks that Sabrina’s role parallels with Susie’s. “With Sabrina we find out about who she truly is, and we find out about these sort of two separate worlds and how they intertwine. In season [1B] it’s definitely a journey to understand that it’s not about the label, it’s not about who you are, it’s about the person inside. It’s about the soul, it’s about that none of this really affects you, it’s how you relate to it that matters. It’s whether or not you, in and of yourself, are still a good person — if you’re the same. I think that’s been really fun to go through. It’s been interesting to see how that storyline — that more fantastical storyline relates to something more real, like when Susie transitions. It’s a very similar feeling where people have to get used to seeing through the label and seeing into who you truly are, as a person [and] as a soul,” they said. As for the fan response to the series and the character of Susie so far? Chilling Adventures of Sabrina Season 1B is now streaming on Netflix. You can see video of our interview with Lachlan Watson below, and stay tuned to our YouTube channel in the coming weeks for more interview videos! Be warned, some SPOILERS for Chilling Adventures of Sabrina Season 1B may be discussed within this video.